Thallus: foliose, medium-sized to large, 3-6 cm wide, thin, membrane-like, loosely attached, broadly and ±deeply lobate lobes: 0.5-1.5(-3) cm wide, thin, 75-100 µm thick when moist, not swollen, few, ±rounded, often somewhat ascending, ±imbricate, not or indistinctly folded upper surface: smooth to rarely somewhat pustulate, dark olive-green, black, dull, epruinose isidia: numerous, often evenly spreading over the lobes, laminal, simple, globose, c. 0.05-0.1 mm wide, becoming short-teretiform and sometimes branched with age lower surface: usually somewhat paler than the upper surface Apothecia: rare, laminal, sessile with constricted base, 1.5(-2.5) mm wide disc: flat to slightly convex, pale or dark red, usually not glossy, smooth, epruinose or sometimes pruinose when old thalline margin: smooth, usually not prominent, usually with thick pseudocortex especially at lower parts true exciple: rather thin, subparaplectenchymatous to euthyplectenchymatous, rarely small-celled euparaplectenchymatous hymenium: hyaline, 90-130 µm tall asci: narrowly clavate, 8-spored ascospores: hyaline, narrowly fusiform to broadly acicular, (4-)6-8-celled, 42-60(-65) x (3-)4.5-6.5 µm Pycnidia: immersed, laminal, pale conidia: bacilliform or with slightly swollen ends, (3-)4-4.5(-6) x 1-1.5(-1.8) µm Spot tests: all negative Secondary metabolites: none detected. Substrate and ecology: on base-rich bark in relatively moist, shady places, also on rock and mosses World distribution: North America, Europe, Asia, eastern and southern Africa, Socotra, India, Hawaii, and Australasia Sonoran distribution: throughout the mountains of Arizona, Baja California, Baja California Sur and Chihuahua. Notes: Collema subflaccidum resembles C. furfuraceum. 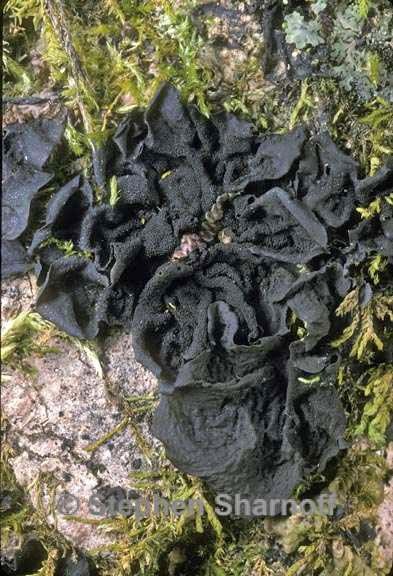 In the former the isidia are globose, finally becoming elongated and somewhat clavate, ±evenly spreading over a smooth thallus. In the latter species the isidia are cylindrical and mainly restricted to distinct pustules and ridges. The saxicolous Collema flaccidum is distinctly ridged and the isidia are scale-like.